Toshi, meaning city in Japanese, is a system of mobile containers which calls to mind the mosaic decorations to be found in certain buildings in Tokyo. 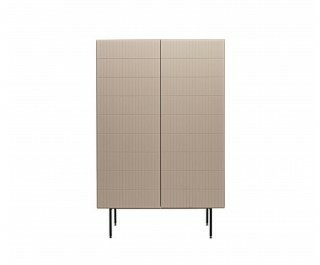 The fresh and essential lines optimise and emphasise the geometric design engraved on the doors of the pieces. Each and every size of cupboard has its own distinct pattern, making the module unique. The reference to Japanese architecture is obvious: a micro city which develops its essentiality in geometric shapes, in proportioned heights and tonal colours. Bearing the weight of the architectural conception of this new system, are two different versions of legs: a single, closed horizontal block, bringing to mind a podium; and another higher one, made up of four squared, metal legs, as if they were the columns of a portico.